We headed into the gentle landscape of fields and woods which separate the western edge of the Broads from the workaday business of north Norwich. Hainford is a scattered parish, its lanes quiet away from the main roads which hurtle traffic through between Norwich and the coast, and connect the A140 to Hoveton and Wroxham,. At a cross roads not far south of the Hoveton road sits this rather elegant little church, the work of John Brown, Richard Phipson's predecessor as Diocesan architect. 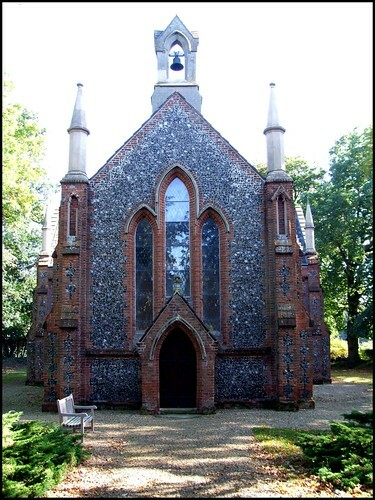 It dates from 1838, and was thus the first Victorian church to be built in Norfolk. It is an intelligent design, with ecclesiological features already balancing the jaunty but ignorant Gothick familiar from previous decades. Red brink outlines the knapped flint walls of a nicely-proportioned cruciform structure, with an impressive west front. There was a keyholder notice, but in all honesty one look through the window was enough to see that no Victorian features survive, and the building is entirely mid-20th Century in style. This was perhaps no surprise, because this is a busy benefice, and the church appears to be used far more often than its remote situation might suggest - for example, the village school is directly opposite. Interestingly, All Saints was built to replace the medieval parish church half a mile or so to the north-east, which survives as a ruin. As often in Norfolk, the opportunity was taken to build a new church nearer to the centre of population. However, the graveyard of the old church continues in use, and so the church here is set in a pleasant lawn, which only goes to make the war memorial at the south-west corner more impressive.